I saw in a magazine where someone had used one of those waffle-looking pretzels as a scarecrow’s hat and just had to try it. The hair is crumbled-up shredded wheat. Great for Halloween or fall parties. What You Need: 1 cupcake; white frosting; 1 square pretzel; spoon-size shredded wheat; 2 orange jellybeans (or M&Ms or other oval or round candy); red mini M&M or red hot or similar candy; 4 chocolate chips or 7-8 mini chocolate chips; black writing icing (optional). How to Make It: Frost cupcake. Stick pretzel into top of cupcake for hat. Crumble up shredded wheat and place under “hat” for hair. Add jellybean eyes, red candy nose and curve of upside-down chocolate chips for mouth. Add pupils to eyes using black writing icing if you’d like. 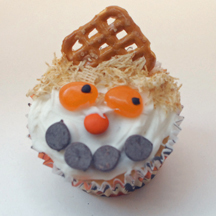 This entry was posted on Tuesday, September 30th, 2008 at 7:40 pm	and is filed under Halloween cupcakes. You can follow any responses to this entry through the RSS 2.0 feed. Responses are currently closed, but you can trackback from your own site.